Aviation News | Ethiopian Airlines To Become First African Carrier to Take Delivery of Airbus A350 XWB Next Year. 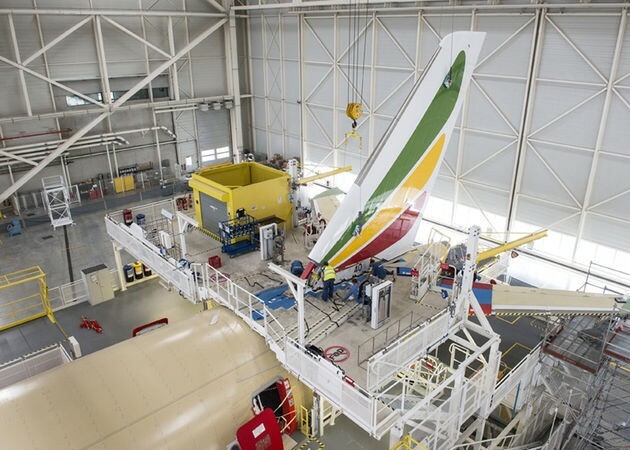 The first Airbus A350-900 for Ethiopian Airlines is taking shape on the Final Assembly Line (FAL) in Toulouse, France. Ethiopian Airlines will be the first African A350 XWB operator when it takes delivery of the aircraft next year. Ethiopian Airlines will operate 14 A350 XWB of which 12 are directly purchased from Airbus and two are on lease from AerCap, including this first aircraft. Mating of the various aircraft fuselage sections has begun and the vertical stabilizer (tail fin) has been attached. Similarly, work has begun on joining the wings, and the horizontal tailplanes to the fuselage, after which its undercarriage will be fitted. All these activities are carried out in parallel with cabin interiors installation and the first electrical power–on, enabling a significant reduction in lead-time. Following this, the aircraft will undergo a comprehensive sequence of tests. Once those are complete, the aircraft will be painted, its engines installed and preparations for delivery will begin. The carrier will deploy the aircraft on its expanding route network linking the East African nation with Asia and America. The Airbus A350 XWB MSN2 will be arriving at Addis Ababa’s Bole International Airport on 11th November as part of its Middle East-Ethiopia demonstration flight tour. The A350 XWB (Xtra Wide-Body) will bring a step-change in efficiency compared with existing aircraft in this size category, as it uses 25 per cent less fuel and provides an equivalent reduction in CO2 emissions. To date, the A350 XWB has already won 787 firm orders from 41 customers worldwide.